STRAIGHT LUG+CURVED LUG: The CHIMAERA stainless steel watch band comes with 2 lugs: straight one and the curved one.The straight one can fits most of the watch, while the curved one only fits some of the watch lug.If the curved one can not fit your watch, try the straight one. TOP QUALITY STAINLESS STEEL MATERIAL: Polished metal surface and premium solid stainless steel watch strap fits your 22mm 20mm 18mm watch perfectly. 12 MONTHS WARRANTY SERVICE: Our products offer 12 months warranty service.If the item you receive were defective and any questions, please do not hesitate to contact us, and we would work out a satisfied solution for you. PACKAGE INCLUDES: 1 CHIMAERA Stainless Steel watch band+ 4 Pins+1 x Spring Bars Remover Repair Tool. 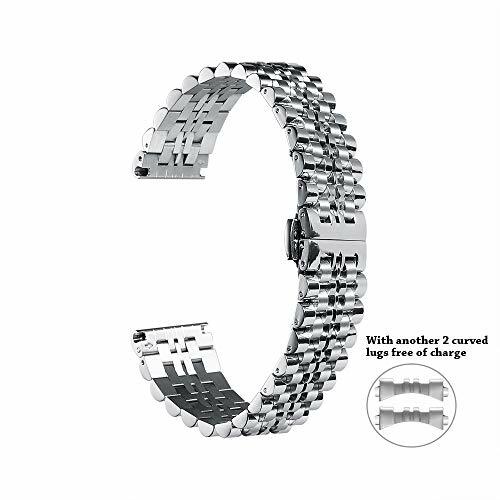 ADJUSTABLE LENGTH WATCH BAND: You could adjust its length to fit your wrist. The length for the watch band is 180mm. If you have any questions about this product by CHIMAERA, contact us by completing and submitting the form below. If you are looking for a specif part number, please include it with your message.